You want to find a niche in your knowledge base. Use the cover photo, title and bio of your playlist to let potential followers know what they’re in for. Include keywords in your bio people are searching for, this maximizes chances of your playlist getting discovered. People are often searching for specific artists so include them in your playlist bio. Keep keywords limited and tasteful. Choose a title that will grab someone’s attention i.e. know who your target audience is very well. This will also come in handy when looking for a cover photo. Visualize the personality of someone who would listen to the artists on your playlists (yourself included) and find a photo that embodies that in one way or another. Use images that are your own or royalty free. Spotify can delete your playlist for copyright infringement. I find most of my images on unsplash.com and photoshop them to include the title on the playlist cover. This makes your account look more legit, and will convince people who don’t follow your playlists that they should be. A giant playlist with all of your favorite tunes is a great starting point, but if you want people to follow your playlist don’t stockpile your music library into one playlist. Categorize your taste into seperate, cohesive playlists. Your playlist should have multiple, but related genres. 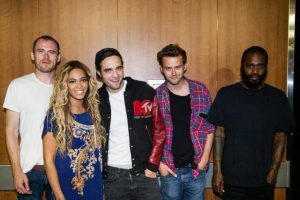 Each track doesn’t have to seamlessly blend into the next, but what you don’t want is a Death Grips track playing directly after Beyonce. My technique is listening to my playlists with a crossfade between tracks. This provides insight into how well it flows as a whole. There’s nothing artistically significant about Spotify’s algorithms generating a list of songs based on user data. There is something special about your personal, lived experience that lead you to resonate with an artist or particular type of music. Get a sense of why you connect with it, and add artists you relate to for the same or similar reasons. 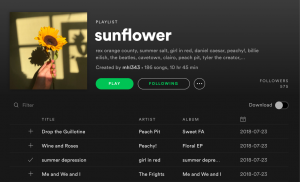 A great playlist has meaning to you. Mutual fans of the same artist will discover new artists, and follow your playlist, if they can sense it was built with intention. The top 8 tracks are your first impression. This is where users are most likely to pick the first song they listen to, and if those tracks are garbage they wont give your playlist a second thought. -Promote your playlist on your social media accounts and ask friends and family to follow them. A playlist with 5 followers will show up in a search before a playlist with zero. -Join zany facebook groups for your kind of music and post in niche subreddits. Your audience is out there, you just have to find a way to get your content in front of them. 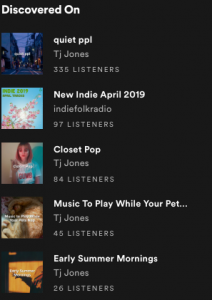 -Once your playlists have gained a little traction, you can search for independent artists looking to get on playlists, if they haven’t already started coming to you. Ask those musicians to share it on their social media accounts and make your playlist their “Artist’s Pick”. Don’t ask artists to endorse your playlist until you’re sure it can gain streams and has a dedicated following. You should only ask if their music is a good fit and you genuinely enjoy it. If you want a career in the music industry, or just want to share great playlist with a large amount of people, good rapport with musicians and mutually benefiting each other’s career is the best way to do so. Checking artists’ “Discovered On” for your playlist(s) is a good way to get a sense of how active your playlist is. Update your playlists regularly but don’t go brazy. People are following your playlists because they saw music that they enjoy. Rotate tracks in and out of your lineup gradually. The single worst things you can do is a major rebranding and delete the majority of the tracks and add new ones all at once. This will almost always result in a swift decline in playlist followers. Most Spotify users won’t unfollow a playlist they don’t listen to. 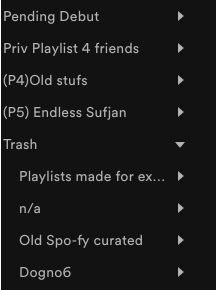 Spotify’s folder feature even encourages grouping playlists so users can follow a large amount but keep their sidebar organized. -Keep your playlists between 50-90 tracks. 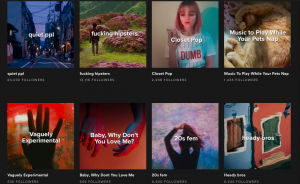 A playlist with over 100 songs can overwhelm a potential follower looking to discover new music, while a playlist with under 40 songs may give them the impression your playlist has finite potential for discovering their next favorite musicians. -Listen to your playlists regularly the following 3 reasons: 1. Your profile followers can see your activity in their friends feed and discover your playlist. 2. Search results are ranked by how many listeners those playlists are gaining. 3. You want to keep your current followers actively streaming from your playlists. If you come across a track you’re sick of listening to, chances are your followers are too. 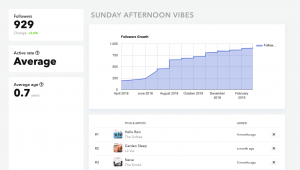 -Use SpotOnTrack.com to keep track of follower growth and other cool playlist stats. 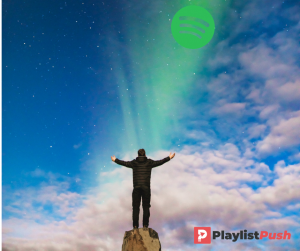 -Once your playlist has over 400 followers you can sign up to become a curator on Playlist Push and start making money from your playlists. 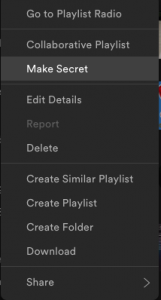 You can also easily track your playlist activity and manage your playlist. If you want to make the next great Spotify playlist don’t expect your playlist to gain hundreds of thousands of followers overnight. The speed your playlist grows really comes down to two simple factors: How easily people searching can find it and if it’s good enough for people to share with their friends. You could get lucky and craft a viral social media post with the first hundreds of followers come with ease. But in the likely case you don’t, follow these steps and you’ll maintain and grow a successful playlisting career.